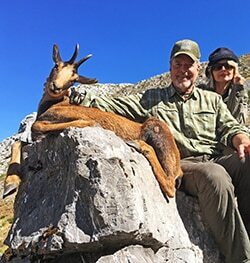 My wife and I have just completed (yet another) hunting trip of a lifetime with Iberhunting Spain. 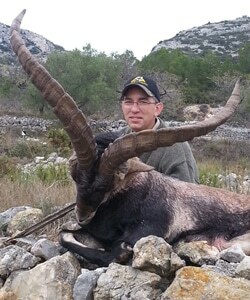 I was returning to Spain to complete my Spanish Grand Slam with a Gredos Ibex; I had successfully hunted the Ronda, Beceite, and Sierra Nevada Ibex with Iberhunting Spain on a wonderful trip with my father last year, and this time my wife accompanied me in order that she could hunt a Balearian Boc and experience what a fantastic country Spain is. We were met in Madrid by our guide Sergio, who had been my guide last year and whom I had specifically requested for this year’s hunt. He is not only an excellent hunter, but a gracious host as well. After a day touring Madrid – including the incredible Royal Palace – we had a wonderful traditional Spanish dinner in a quaint old establishment and then retired to our hotel room to rest up for the next day’s flight to the Mediterranean isle of Mallorca to begin my wife’s hunt for her Boc. Upon arrival in Mallorca Sergio took us to our temporary home for the next few days – the Hotel Son Sant Jordi, a 17th century Spanish inn located in heart of the town of Pollensa. What a wonderful, quaint, old-world structure it was; it – and the surrounding town – gave you the feeling that you had gone back in time to Spain centuries ago. We made a quick hunt in the afternoon, where we spotted several quality Bocs, but Sergio and our Rangers Gabrielle and Raphael knew there were larger animals to be found, so per their instructions my wife passed on the first few on that first afternoon. The next day Sergio and Gabrielle guided us to a silver medal class Boc right off the bat; my wife was eager to shoot this beautiful animal, but again our trusted companions urged her to wait for a larger one. Several hours later Raphael tracked us down as we hunted a different area and informed us that there was a very nice Boc that had somehow been mortally wounded earlier in the day and which was going to either die a slow agonizing death or possibly stumble off the edge of the 1,000-foot cliff where he laid on the coast of the Mediterranean, only to be consumed by sharks. My wife immediately offered to use her tag on this animal in order to do the humane thing and put it out of its misery. She made an excellent shot, and upon approach we realized that the animal had a beautiful hide, an extremely long double beard (the longest I have ever seen), and excellent, gold medal horns, and she was more thrilled in the way that its harvesting had come about – necessity and compassion – than if she had stalked it from 1,000 yards. 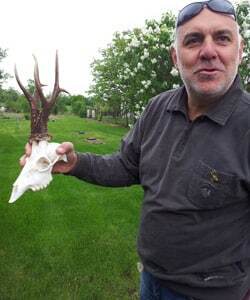 Now that’s a true hunter and conservationist. The next day we were off to the town of Jarandilla at the foot of the Gredos Mountains west of Madrid, where we were treated to three nights in the Parador De Jarandilla, a 14thcentury castle (yes, a castle) that was formerly the retreat of the Kings and Queens of Spain and other royalty. After yet another excellent meal we retired and prepared for the next day’s hunt, which would soon become the most incredible hunting day of my life. We were met by Rangers Norberto and Jose early in the morning, and with them we traveled to the mountains to begin our hunt for the Gredos. We initially began in a river bottom, but soon turned back as the weather was going to be warmer than expected; we would have to travel further up the mountain as the Ibex would be much higher in elevation in order to stay cool. We soon split up, with long-legged Jose taking off alone in order to get higher quicker to try to spot some animals. Natalie, Sergio, Norberto and I paralleled him somewhat lower, while still gaining quite a bit of elevation as we hunted. About 3 ½ hours into the hunt, we spotted a very nice Ibex about 600 meters yards away. We slowly and carefully made our stalk and once we were about 250 meters away I set up for the shot. Somehow I missed, and the animal bounded off unscathed. We were all very disappointed, and I was shocked and embarrassed at my shooting skills (or apparent lack thereof). We continued on, all of us knowing in our hearts that I had blown the hunt for the day. But wait! Up ahead Jose spotted another Ibex, and after another stalk I was once again within about 250 meters. This time I was able to connect, and we soon realized that the Ibex we had taken was even larger than the one I had missed earlier. It appears fate was on our side. After some lunch, photographs, and skinning of our animal we made the long hike out. It had been an 8-hour day of hiking, and we felt we had truly earned this wonderful trophy. The remaining days in Spain were spent touring the country and sampling the food and wines, which was an adventure in itself. There comes a point, when hunting Spain, as you stalk the same creatures that have been stalked there for time immemorial; as you pass by the remains of buildings and aqueducts that were built thousands of years ago, often far back in the mountains a hundred miles from civilization; as you tour the castles and churches in the towns that have been providing shelter, comfort and spiritual guidance for centuries; as you witness and interact with the Spanish people as they go about their daily lives with the same mannerisms and customs as their forefathers and their forefathers for many, many moons; and as you eat the food and drink the drinks that have been eaten and drunk – in very much the same way – for an eternity; that you feel a true connection to not only Spain itself, but to old Spain, as it was and as it has been and as it will seemingly (and hopefully) be forever. In fact, you sense a connection there to the entire human race, as it has always existed, and as it always will, on a deep and transcendent level. And you look around in awe. And you want to come back again and again. That, my fellow hunters, is a moment that is indescribable, unforgettable, and mystical, and more valuable than simply the hunt itself to which it is tied. Thank you, Sergio, Antonio, Iberhunting and Amigos for guiding us through such a wonderful opportunity and adventure. We look forward to many more in your company. Thank you very much for the best hunting experience of my life so far. Cazorla was a fantastic hunting area (incredible nature) and we had a nice time at the hotel. It was an enormous success! Hi Antonio, like you know, our adventure started in 2012 meanwhile we’re already in 2019. I dare say that we’ve had a few adventures. Since then we’ve crossed the entirety of Spain and it became time to discover different places. It started in Greenland, you succeeded in persuading me to join trip. But with an organization like Iberhunting I dared to take the leap of faith. The 26th of august was another big challenge, you persuaded me to go hunt in Kazachstan. From Frankfurt we left together with Filip and Jan towards Almaty and from there another 11 hours of driving to the border of China. The hunting on horse with bag and baggage and a little tent, it was amazing. The landscape and the experience, we could tell so much about it but still we wouldn’t be able to describe our experience. Sun, hail and snow we had it all, but through perseverance the result was 100%, we all had our Capricorn and even bit more. Jan, Filip and I experienced an amazing time thanks to your organization and the close ties you had with the local guides. I dare to recommend this adventure to everyone, but only with your organization. Again the preparations, the checklist, the flight and the stay after the hunt was managed excellent as per usual. Antonio God willing we’ll have many more adventures together. After my first hunt for Sierra Nevada ibex in January, I returned for my second hunt here in November 2018. This time I was staying In a little town called Bacares in Hotel Las Fuentes. Fantastic place and top food. My guide Sergio was ready at my arrival late afternoon and no time was wasted we went out in the mountains for hunting my Ibex. Iberhunting.com and Sergio know their business and soon we spotted some animals and we started our stalk, but the dark came and we decided to stop for the day. Next day we went out early in the morning and again we spotted animals but a long distance to us, this is what I like about this kind of hunt, difficult and exciting. At one point we came very close and I was ready to shoot my ibex , but hunt is not easy and the animals took away just 100 meters in front of us. After 4 hours and walking in the mountains, we finally saw a very nice Ibex laying on a rock down the hillside. We had a good look at the Ibex and decided that this was a Very Nice Sierra Nevada Ibex. Very silent I placed my Rental gun ( Blaser with 338 mag) on the top of my backpack, and I had to get my pulse down, at this time the animal stood up and we were sure that I needed to be fast on my shooting. One more breathe out, and I made a perfect shot to the animal who went down on the spot. 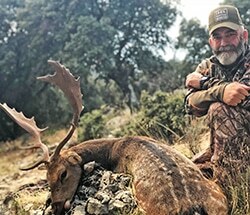 This hunt is one of my best hunting experience ever, and I thanks Iberhunting.com and Sergio for this. It was our first hunting trip with Iberhunting, and I have to say it was excellent. Starting with the connection, the presentation of the offers, the accommodation in the decision-making, the short wire, the accommodation, the food, the very experienced hunting guide, the abundance of game in the hunting area to the friendly care, responding to wishes and appreciation. Within three hunting days, we were able to enjoy the abundance of game in the hunting area and hunt for two very beautiful trophies. It should be emphasized that at Iberhunting each hunter gets his license for the selected or ordered piece of game and this remains valid for several years, if it should not be able to stretch a creature in the scheduled hunting days for whatever reason. This super package makes Iberhunting very attractive and on the next hunting trip to Spain Iberhunting is our partner again. Thank you very much. Hunting with Antonio and Sergio of Iber Hunting was an absolutely amazing experience. My wife and I were treated like family from the moment we arrived in Spain. 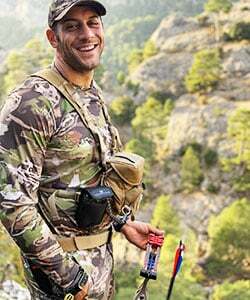 Being a bow hunter I was nervous as there aren’t many that travel to Spain but Antonio and Sergio never discouraged me got me on numerous game every day I was there! 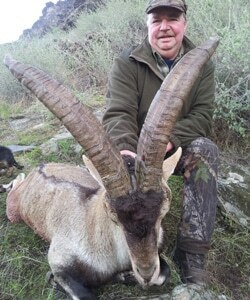 I was able to harvest a beautiful Sierra Nevada Ibex on my second day and it was truly a dream come true. I can’t wait to return back to Spain with Antonio and Sergio for more hunting! I want to take this time to tell you just how much I appreciate all of the work you both put into getting Maile and I to Spain for a hunt I will remember for the rest of my life. I had no idea what to expect on this hunt. Although the hiking was much more challenging than I could have ever expected, it was an invigorating opportunity to challenge myself. Although harvesting all of the animals I had the opportunity to take was a great experience, the time together with you was much more meaningful and will forever be engrained in my mind. Thank you for all of the incredible memories!! I will never be able to repay your for the trip of a lifetime, however you will always be welcome at our home in Texas or Wyoming. I look forward to seeing you this January in Vegas. Keep well and hunt safe. Dear Mercedes and Antonio, we have had a great hunting day, in Spain, with very professional guides. everything was very well organized from the booking to leaving. We are looking forward to go on hunting with Iberhunting again in Spain or around the world. From an organizational standpoint Antonio of Iberhunting.com was excellent!! He provided me with the necessary information to book the hunt and details on needed gear and what I could expect. The accommodations were very comfortable and enjoyable. Antonio was an excellent guide and I was able to harvest four species during this 10 day hunt. Unfortunately, due to weather conditions, we were unable to hunt the Chamois. Having early success allowed Antonio to show me some of the sites and take in some of the excellent cuisine that Spain has to offer. 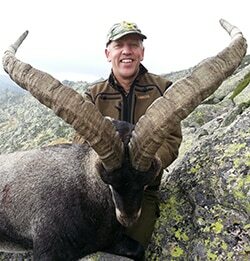 I would recommend this hunt to anyone who is starting or finishing their Ibex Slam. I appreciate the time and effort Antonio put in to make this hunt as advertised and as expected. 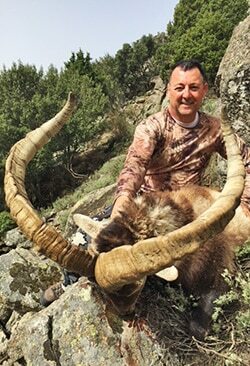 Personal note to Dennis Campbell: I had a very enjoyable experience hunting with Antonio Teruel of IBER Hunting Spain earlier this month. I met Antonio last year at your GSCO Slam Quest Convention in 2017. He provides a high quality service, is very passionate about his work, and you are fortunate to have him represented at your show. 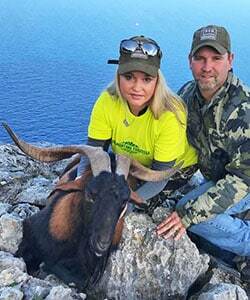 “We met Antonio and Mercedes Teruel of IBER Hunting Spain last year at the GSCO Slam Quest Convention. They were new exhibitors at your convention, and found them to be very qualified, with over 30 years of guiding/outfitting in Spain. 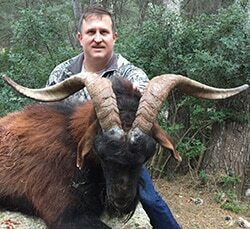 I signed up to hunt both the Cantabrian and Pyrenean Chamois, while touring some of the most georgeous historic mountain regions of Spain. The hunting itself, was fun and exhilarating, with lots of hiking/climbing. Antonio is very good man, organized and holds excellent relationships with the locals in the mountain ranges we hunted. We enjoyed the rural setting, the food, lodging, historic villages, local people, etc. Spain. 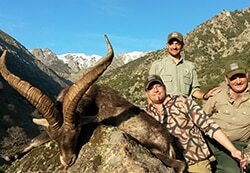 It all started when I decided to purchase an Ibex hunt that was available during the silent auction at the 2016 GSCO convention. 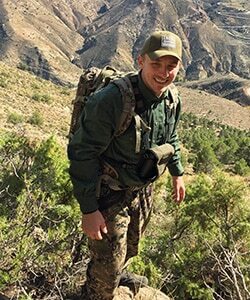 I had no knowledge about the outfitter, but the late Dennis Campbell assured me that Iber Hunting was a class act… and as always, Dennis was spot on. To get the ball rolling, I had started working with Antonio and his wife, Mercedes; and before I knew it, I had 8 animals booked. The decision was made to do the hunt in November of 2017, and October 31st, I was on my way to Madrid to start my 25-day Spain safari. The number of animals I booked, along with the distance we needed to travel between them, was a concern for me as I was not sure this could all be done in 25 days. But, Antonio from Iber Hunting made it look easy. 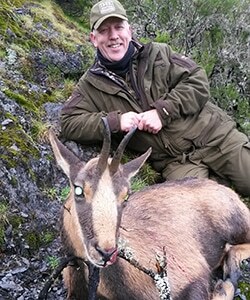 Only 7 days into the hunt, I had already taken both the Pyrenean and Cantabrian Chamois, as well as a very good Gredos Ibex. 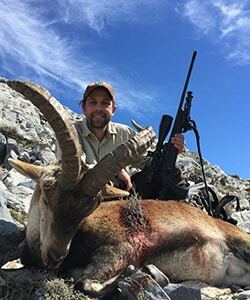 By day 12, we hunted an Aoudad Sheep, Southeastern Ibex, and Mouflon Sheep, and were able to take a wild boar and female Mouflon along the way. 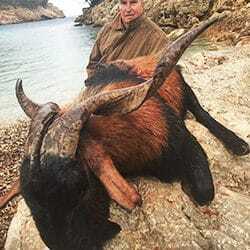 At this point, we found ourselves ahead of schedule, so we decided to take a side trip to Mallorca, where we were able to successfully hunt the Mallorca Wild Goat. With Iber Hunting being a licensed travel agent, an added trip such as this was easy to do! By day 15, we were back on mainland Spain hunting Ibex again. 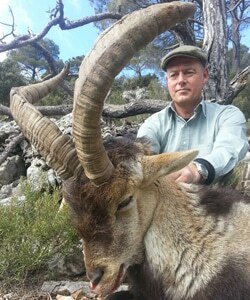 Over the next 8 days, I was able to take a Great Ronda Ibex, a fantastic Beceite Ibex and a 2nd Southeastern Ibex. I was even able to add a female Southeastern Ibex to help fill my Spain mountain mount. When the smoke had finally cleared, I had harvested a total of 12 animals and covered the entire country of Spain, all in 25 days. This is truly the trip of a lifetime. Antonio, Mercedes, and the entire group with Iber Hunting are top-notch. Everything from the pre-trip planning, to the 5-star lodging which we stayed in were first class. Even the food was over the top. One week into the hunt, I told Antonio we needed to back off on the food as my wife would not believe I was sheep and goat hunting if I come home gaining weight. For all you North American mountain hunters! 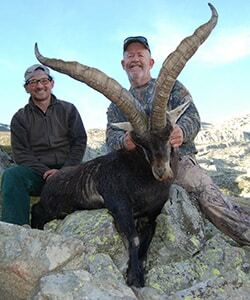 Spain is a beautiful, exciting, and affordable mountain hunt. At the end of the day, I spent 25 days and was able to harvest 12 animals, all for about the same price as a Stone Sheep Hunt in B.C. To obtain a great value, and experience the trip of a lifetime – Iber Hunting is the place to start! I would like to tell you about a trip I took to Spain this year, but first I want to share some details about myself. I am 74 years old and have been booking at least one guided hunt every year since 1976 except for the last 2 years for every thing from quail to elephants. After 2 years of failing health, in 2015 I booked a to Pakistan, which I felt would surely be my last hunt. During the hunt I had a guide by the name of Mete Babaygit from Turkey. During the hunt, I was struggling physically and thought I would have to quit, but Mete would not let me. He said “Just hold onto me. I will carry you if necessary.” We were successful. Two weeks after I came home, I was diagnosed with a meninges, a form of brain tumor. Mete and I continued to stay in touch, After 3 operations and a year’s recovery, Mete told he he thought he had a hunt I could could do if I could get back into reasonable shape. 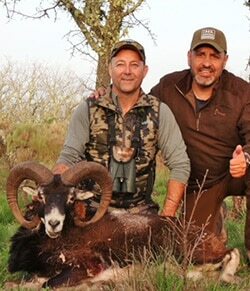 The plan was to hunt 4 ibex in Spain with Antonio, a friend of Mete’s, starting with the easiest one and working up to the hardest one. 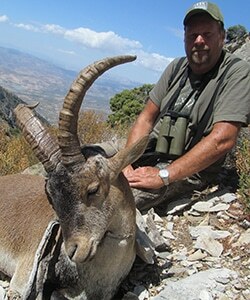 The hunt sounded so appealing that I also had him book a hunt for my son, Chuck, for 3 ibex. Upon arriving in Malaga, Chuck left with one of Antonio’s guides, and Mete and I left with Antonio. Within an hour, we were hunting in a national park. The only criticism I have ever heard of Spain was this it a more or less spot and shoot hunt. We did not find that to be true, We had to work hard for out animals. There are just just so many animals there that it is hard to not be successful. It is a true fee range hunt. I would have to rate this as the best experience I have had in my in 40 years of guided hunts. Both Chuck and I were successful. Antonio was the perfect host and seemed to know everyone in Spain. We stayed in nice hotels, and the food was delicious. In fact, I had to pass on dinner 5 nights because I had eaten so much for lunch and breakfast, Chuck is booking for the Gredos that he did not have a tag for this year, and my other son is booking for 2019. If you are interested in this hunt, I would be glad to share it more fully with you. I recently completed the hunting trip of a lifetime. I live – and hunt – in Montana, and have hunted many other places in my lifetime, including three excellent trips to Africa. 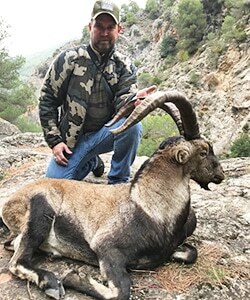 This year (2017) my father and I traveled to Spain to hunt Spanish ibex. 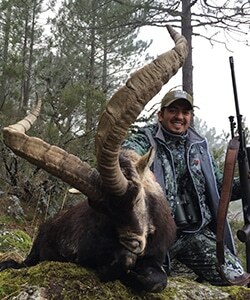 We booked our trip with Antonio Teruel and his world-class company Iberhunting through my father’s good friend and hunting companion Mete Babayigit of from Turkey. Upon arrival in Malaga and introductions with our new friends Antonio and my guide Sergio, and meeting Mete at the airport, we were whisked away to a beautiful Spanish hotel, and then taken to a fine Spanish dinner. It was a classy beginning to our awaiting adventure. 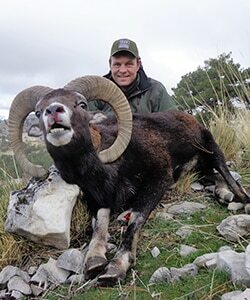 The following day we all hunted together, and I took my first ever ibex – a Ronda. It was hard to decide what was more beautiful – the hide or the horns. At that point we split up, Sergio and I traveling north to hunt for Beceite and Sierra Nevada and my father, Antonio, and Mete remaining to hunt Ronda. Upon arrival to the Spanish Sierra Nevada mountains we spotted several ibex before dark, but were unable to make a successful stalk on any legal males. 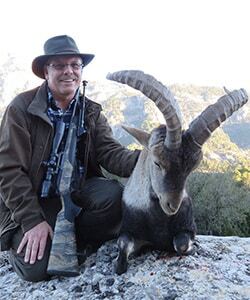 After a restful night and another wonderful dinner in Bacares in a quaint Spanish inn – La Fuentes, owned and operated by Sergio’s mother and uncle – Sergio and I traveled further north, where we were able to take another excellent specimen, this time a Beceite ibex. 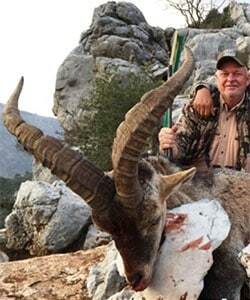 Having now taken two of the three ibex I had come to hunt, we returned to Bacares, where I eventually took my third and final animal, a majestic Sierra Nevada. We then met back up with my father, Antonio, and Mete, and I was joyfully able to accompany my father when he took his Sierra Nevada, an old bruiser for sure (my father, or the ibex? Hmmm, that’s a tough one…) I then had to return to the States while my father stayed behind, eventually collecting all five species of ibex he had come to hunt. 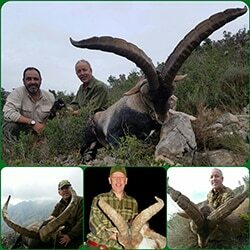 While this was clearly an extraordinarily successful and enjoyable hunt based on the magnificent Spanish ibex we were fortunate enough to collect, I must say that the hospitality and comeradarie that we shared with our guides and all the people we met along the way, the breathtaking geological and architectural creations and olive and almond groves we witnessed in our travels and hiked through on our hunts, the delicious Spanish food and superb accommodations to which we were treated, and the simple and relaxed immersion into the ole-world Spanish lifestyle and culture that we felt and experienced which could not have been appreciated without such marvelous hosts, is what put this particular hunt over the top and made it one that could never be equalled. Thank you Antonio, Sergio, Mete, Diego, Jose, Paco, Maria, Jose, and everyone who made this journey an escapade that I will never forget. 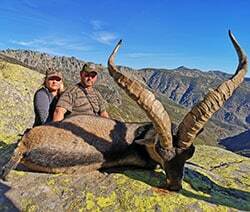 I can’t wait to return with my wife and possibly my brother and his wife to complete my Spanish Grand Slam with a Gredos ibex and accompany my loved ones in their quest for their Spanish Ibex and adventure of a lifetime. I now dream of it every night. I will see y’all soon!! First of all thx for a great experience to you and your staff, they provide us with so many fantastic adventures. We arrived in Malaga airport, and was quickly through custom with our weapons, as the officer new Iberhunting, so no worries or extra explanations there. Pick up was quick, and soon we were on the road to Berja, and what a nice surprise – the landlord was Danish and an excellent chef. We were met at the accommodation with Antonio and his staff for a dinner and introduction and check of weapon and cartridge for Ibex hunt. Next morning we were on the road for spotting Ibex, which should be of the correct age and size, after the first lunch and many seen Ibex, my team spotted a group of Ibex with a fantastic male so then after a little discussion about how to attack the hunt, we decided to drive sideways at the mountain for 1 km and the we started the hunt, and after about 2,5 hours hunt through the rough mountainside, I succeed to shot the Ibex, a beautiful silver medal at the age of 11,5 years. Then we had to drag the animal down to the road, which took me and the outfitter around 1 hour, and a lot of sweat, so we were exhausted and wet when we arrived at the mountain road, and got in contact with the driver. 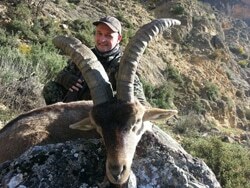 Many thx for an excellent and very hard hunt, succeed with a beautiful Ibex. PS I slept like a baby that night. 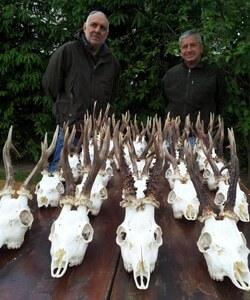 I just returned from my first trip to Spain with Antonio of Iberhunting. My wife and I had a wonderful time. All aspects from start to finish were outstanding. Everything from accommodations to the food was first class and exceeded our expectations. I would recommend Iberhunting to anyone contemplating a hunting trip in Spain. I hope to be back soon myself. 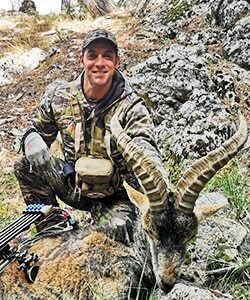 Having hunted extensively during the past 10 years on 4 continents, I rank my recent Ronda ibex hunt with Antonio firmly amongst my top 3 hunts. Iberhunting delivers excellence in all key parameters – guiding, lodging, logistics and trophy quality, qualifying itself as a true top-tier outfitter. Simply just a fantastic hunt that I would encourage anyone to experience. Personal references are welcome by telephone request (+45) 27150764. One of my best trips yet. Perfect for one and perfect for two. If you are looking for the perfect place to take your better half hunting. I will particularly recommend this place and Iberhunting as organizer. The hunting is located in the national park and when back at the beautiful valley hotel, your host, the other hunting guests and various spa’s and the Michelin star rated kitchen awaits you. Every detail is very well organized and guided. All the way from booking to leaving. The terrain can be easy slow up & downhill walking or hard work and climbing, if that is what you prefer. In both cases the hunting is perfect. I know, cause we did both. Hunting is spot and stalk, in the most magnificent mountains, in a perfect for walking temperature/climate. We saw lot and lots of game, from fallow deer, red deer to Ibex and vultures. Lots…!! I was the only gun carrying hunter on our trip, but my fiancé actively hunted as well, by spotting and stalking just like the guide and I. 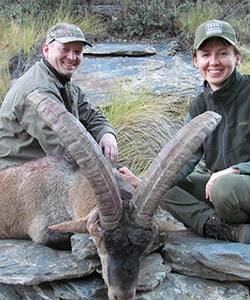 We got a nice representative Ibex, a very nice selective “einwachser” Mouflon and two females. The national park is relying on hunters for completing the eco circle as toppredators, which makes the hunting a lot more than just getting a trophy and having a good time. I love this place and intend to go back there soon. 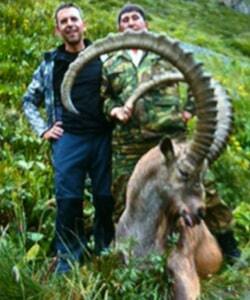 It was my greatest hunting ever, together with Antonio, hunting the Sierra Nevada Ibex. The hunt was perfect and it was my first hunt outside Denmark. After 2 hour with the scoop looking at the beautyful nature and after the right size of Ibex, we found him nearly 500 meters from us at the other side of the mountain. 2.5 hour later he was 207 meter from me, and with a perfect shot he was down. 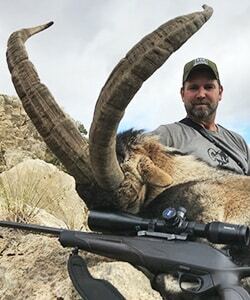 I have dedicated my Ibex to a good friend of me, there was kill in a accident 2 weeks before my hunt. My best recommendation to Antonio and he’s team. Mercedes and Antonio – thank you for the perfect organised and successful hunt in Sierra Nevada. We were in Spain for the first time, but for sure not for the last. 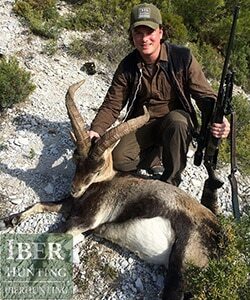 We have found Iberhunting as a very reliable company, which can be highly recommended. Best regards, Anna and Marcin. Another hunt with Antonio, and this time with Christian as local hunting guide in the search for Beceite, in the beautiful mountains near Rossell, the weather was after November conditions hot and there was fine presence of the female ibex, but the male was not so accessible the first day and the second day was spent on some observation and hiking in the mountains, the end of the day we managed to get close to a group of 4 goats which of the two was representative and two trophy ibex, after an exciting hunt I succeeded by take a nice example of Beceite Ibex. Once again thanks to Mercedes and Antonio, with many fantastic experiences in the beautiful Spanish mountains, supplemented with good food and beautiful hotels that reflect the areas we have visited to take down my Spanish Grand Slam at the 4 ibex. We were the first Finns that hunted with Iberhunting. So it was not a surprise that we had some worries before the trip but we more or less right in the beginning realized that it was not needed! We had a trip of the life time! We have been hunting in different places during the years and this trip was one of the best ones or even the best! Hunting in the mountains of Spain was exceeding all the hopes and it was awesome to end the experience to Monteria. Once more thank You Mercedes and Antonio about wonderful memories. Matias Huhtala (Finland). On behalf of Team Hubertus. Back again a beautiful week of hunting with IBERHUNTING. This was the third huntingtrip for me with Iberhunting and all three were above expectation. Aswell for the accomidation,the food, the hunting as for the general take care. 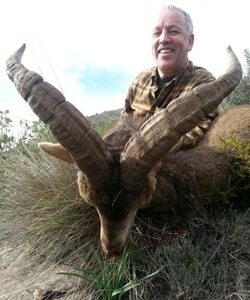 I onely can highly recommendant IBERHUNTING when you wisch to hunt in Spain without any conserns or problems. Look forwards for the next trips. Everything was perfect about this hunting adventure with Iber Hunting. The accommodation and the service in each location was on top of the line in fact exceeded my expectations. I met Antonio through my friend Matt Guedes of journeyhunts.com with no doubts Antonio is the best organizer he made our 14 days traveling between 6 different locations all over Spain so easy and joyful and of course helped me accomplish exactly what I came for. 14 days made me know them very well and felt like one family towards the end of this journey. This is my first with him but for sure he’ll be my source all over Europe for any hunting adventure. Thank you once again for the amazing experience Antonio! Tuff hunt compounded by a persistent back/leg injury, but the preacher talked me thru it, Thanks Matthew Guedes JourneyHunts.com About a 14 km trek up and down to 1900 meters! 375 yd heart shot in heavy winds?!? 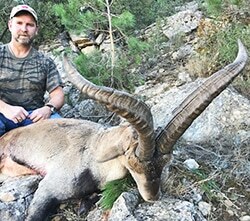 Kudos to Antonio owner at Iberhunting in Spain. What a wonderful location to base camp out of. Would love to be there during season to enjoy all the spa facilities. Lolo actually opened up Spa Coto del Valle in Cazorla, Spain just for us! Food was amazing, way beyond great! Presentation was artistic, variety was extensive, and even personal preferences and needs were handled graciously and beyond expectation! Truly a hunt that you could take the significant other along on with no disappointments, and reasonably priced for non-hunter also! And on the important side of the trip, the hunting was more than expected. Great variety of game seen every day, stags, mouflon, fallow, besides the Ibex like pictured above. And the scenery was amazing. Looking down over old castles and quaint Spanish towns perched on the edge of the steep mountains and cliffs with amazingly well maintained roads and trails all within the expanse of a national forest! Antonio spared no expense or personal effort to make everything perfect. 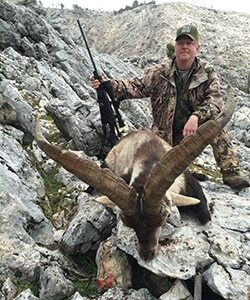 He even took us on my last day of Ibex hunting to a personal honey hole, that allow me to make a great shot on a nice Sierra Nevada Ibex. He and our ranger guide Nito, even insisted on carrying my gear and trophy back down, as they knew my leg was hurting badly by then. After a tuff climb to the top and a careful sneak into position above the herd, down was definitely a harder effort! I have had the privilege of hunting all around the globe. In over 20 years of hunting guided hunts I have not found anybody as professional, complete, well organized, and one who hunts as well as Antonio and Mercedes do. Everything from the accommodations to the meals to the actual hunt were done in a first class manor. Iber Hunting will be the European and Middle East hunt choice for Journey Hunts and our clients. Once again we decided to go to Spain for hunting with IBER-HUNTING. 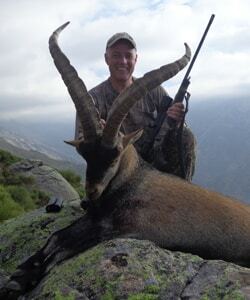 This time is was for Beceite Ibex, which was the last one I lacked to get the Spanish Ibex Grand Slam. Mercedes and Antonio had arranged that we were staying in a nice golf resort, so we could play golf when the hunt was over. A nice way to combine the interests of the family ;-). As Antonio and the ranger said the first day – two hours then it is over!!! We just need to drive up into the mountains, locate the animal herd and shoot… But it turned out, however, that the hunt was not quite as easy as expected. 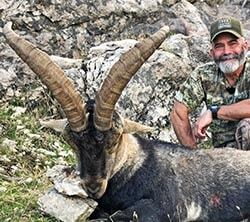 It took three long and intense hunting days in the mountains before I got my Ibex. Last days at the very last hour we managed to spot a bronze medal ibex out at 350 meters… I took the shot and succeeded. What a great experience ;-). Thanks for yet another wonderful holiday and unforgettable hunting experience in Spain. And thanks for the fine “spanish Ibex Grand slam” present you brought me. It is appreciated and looks great in our living room. We will definitely come back 😉 See you. Thanks for the Best hunting Ever. I must say that mountain hunting is some of the hardest hunting. Iberhunting is top of World hunting. The food was by far the best I have ever had on any hunting. The Rangers were absolutely fantastic, Antonio definitely goes out of hi way to provide a first class hunt from start to finished. No, need to bring your rifle, Antonio has very high – end rifles availabel. 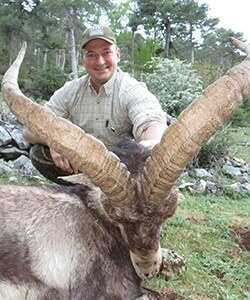 I had the very good fortune to come across Iberhunting when looking for an Ibex hunting opportunity in Spain. I say good fortune because there is always an element of risk when booking a hunt, and you never really know what to expect. You rely on word of mouth or reviews you read. Well, I found a gem, so if you are weighing up options and comparing different outfitters, I can honestly say that you should probably stop here. I cannot imagine that your hunting experience would be better with anybody else. From initial contact, help with anything and everything regarding planning, transport (even, as in my case, when you arrange your own) and regulations is done with down to earth friendliness that epitomises Spain and how the hunting community should interact. This made getting there and arranging everything a breeze. Once ‘on site’, the experience was even better. 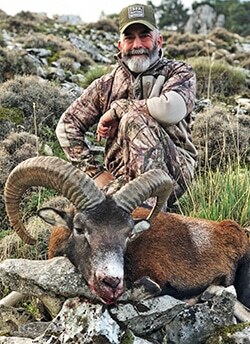 In my case, we were hunting Ibex in the Gredos mountain reserve – we met Antonio from Iberhunting at the organized accommodation which was a perfect blend of local charm and cuisine, ideal location and hunter-friendliness…everything went smoothly and the whole feeling was one of warm welcome. 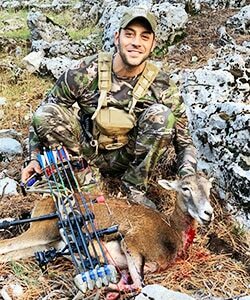 Antonio was a perfect host who has obviously established good relationships with the hotel(s) he uses, and provided entertaining stories as well as pertinent advice for the current hunt as well as overall hunting opportunities in Spain and elsewhere. I got the sense that he is interested in building and maintaining a good reputation based on delivery of a good service at a reasonable price that will encourage hunters to return, as opposed to just ‘selling a hunt’ for short-term profit. The hunt itself was outstanding. All hunting takes place in the reserve (which, from what I understand, is the case for all Iberhunting hunts) so you are assured that the quality, quantity and sustainability of animals is actively managed. This makes a big difference unless a) you do not care about environmental issues and b) you are willing to take the big risk of arranging a hunt in areas that are shot out or with very marginal populations. Because it is a reserve, your guides are reserve Rangers who know the mountains and animals very well: They know exactly what you are after in terms of trophy size and are extremely knowledgeable. In fact, they are scarily capable of estimating trophy size very accurately at distances way beyond shooting range! After careful scoping, walking/climbing and finally stalking a viable Ibex and getting into position for a shot, the guides are extremely helpful and take control without ‘taking over’. Once down, the trophy was properly tagged and well cared for in preparation for the taxidermist. There was no pressure for handling the trophy – the choice is yours. 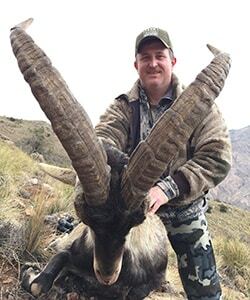 I chose to have the trophy mounted in Spain by the taxidermist that Antonio deals with – I have yet to get it, but have no doubt that I will like the end result. All-in-all, a very pleasurable trip and excellent hunting experience with an outfit I would not hesitate to recommend to anyone! We would like to acknowledge a superb event, when hunting the above mentioned species. On the Photos you can see the impressive results, but we have many other big experiences in our memories. 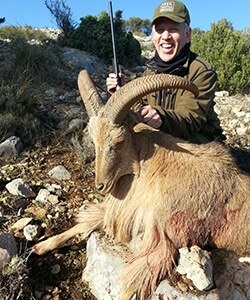 The Hunt took place in ”Parque Natural Sierras de Cazorla” – a big mountain area northeast of Granada. The terrain was rough with sharp cliffs and big ravines and spectacular views – and lots of game! On the first two days we observed Red Deer Stags, hinds and calves – Fallow Deer full shuffle plus lots of Pricklets an hinds with calves – mouflon rams and females – Ibex both bucks and females and Wild Boars. It was exciting and very nice, to see so much game in the free nature, and it was certainly a fact that made this experience both fantastic and special. It is difficult shots and the hunter is being tested – rather long ranges and odd angles. The Mouflon was shot from the “valley”, which means a shot angled up, at a distance of 120 y and the Ibex was taken from a high position with a shot nearly 200 y – furthermore it was on the other side of a ravine with steep (read vertical) slopes, but we succeeded in coming down and over and up again to the place of action – so there is a reason why we look so happy and satisfied on the Trophy Photo. The fact, that the weather was good and the Hotel also was top of the scale with fantastic food and wines and service, did that we in all had a very nice experience in Andalucia. We would really like to come again! Kind regards from Birgit & Klaus. We definitely had a wonderful time. You and Antonio take care of every detail, which makes the experience extra special. We really appreciated how Antonio made things so enjoyable by having such good relationships with the game rangers and small restaurants in the different areas. We think you have developed an excellent hunting program, which anyone would appreciate. The touring, food, accommodations and hunt were exceptional. We really look forward to hunting with you again. I wanted to thank you and Antonio once again for the excellent organization. Gökmen’s specifically asked me to tell you that it was a pleasure hunting with you. Thank you for a very good time in Spain last week. Everything was very fine and ok. I shoud say Hello from Troels and tell you that he will be back, and next time for, Sierra Nevada and Ronda. Thank you so much for very nice hunting day. Everything was very well organized and I’m looking forward to next time we meet up. Spain much more than beach, sun and paella :-). For 3 days we hunted in the National park Cazorla. Organizer Iberhunting with Antonio Teruel. The area absolutely fantastic, nature very special with steep mountains and wide open highland. And a lot of animals in really good condition. 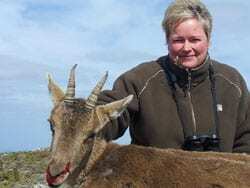 I got my first trophy Ibex and Mufflon. And we did some really good administrative hunt for females. We will be back soon. Many thanks to Antonio for this memorable adventure. 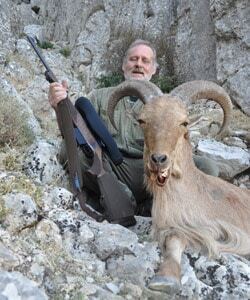 Spain also a country for hunters!. Jan.
Once again, a great hunting experience accompanied by you, This time you attracted us with the hunt for the smallest Chamois, the Cantabrian, we got 3 successful hunting days with 3 animals taken, one each day. And as always, there are well taken care of meals and accommodation. A challenging hunt in the beautiful Sierra de Ancares where we saw everything from fog, rain and strong wind to a beautiful sunny day at the end. This is mountain hunting that will be remembered with excitement, thanks for some great hunting experiences. It was a nice and very very good hunting. It was hard to me but i hope we can do it Again. I hope you can make a trip where i can shoot a manke sheep. I want to thank you for three great hunting days. It was a true pleasure to hunt with you!. 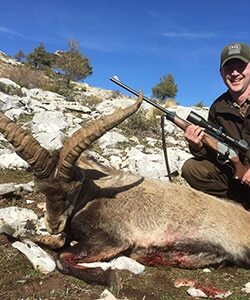 It was a great experience to hunt the Sierra Nevada ibex and the mouflon in the vast and wild mountains of Sierra Cazorla with the many panoramic views and apparently untouched wildlife. Your local guides are very experienced and a pleasant company, too. On top of the good hunting experiences both the accommodation in the mountains and the delicious Spanish food and wine finished the impression of a very successful hunting trip. I look forward hunting with you again! 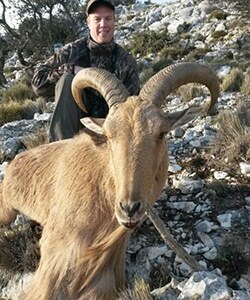 Thank you for some unforgettable hunting days for Aoudad sheep in De Sierra Espuna, Murcia, I had some greatdays with many experiences in the beautiful landscape in good company with you and your other hunt guests from Norway and Denmark. The Hunt purpose was Aoudad / Barbary sheep and hunt goddess Diana, smiled upon us all by showing us severalAoudad sheep in the mountainous terrain, and we also had some interesting experiences with hunt for wild boar and experience to feed the Fuente del Hilo well-known “not so wild” Wild boar. I look forward for even more hunt experiences with you. I want to say a big thanks for the yours hospitality during our days in Spain. The days is without any doubt the best organised hunting tours, that I have ever been on. Everything was on a high standard, the food, atmosphere, nature and hunting ground. The openness of all the people involved, they made us feel very welcome. 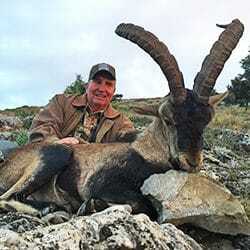 Gredos ibex hunting is probably one of the best in my hunting life this is my 3rd hunt with Iber hunting and this time it was with my famlie son – daughter and girlfriend Jill. 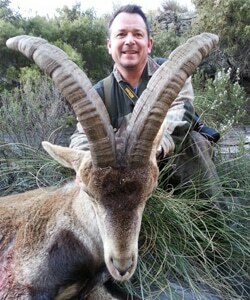 it was a great experience to shoot a large bronze medal gredos ibex and then shoot 4 selection ibex. on the same mountain. in my memories I still come back to the beautiful nature, beautiful ancient cities and unforgettable hunting experiences. Equally amazingwas the culinary experience. You’re an excellent hunter as well as excellent gourmet. Thank you again. Thanks to you for probably one of my best hunts ever. 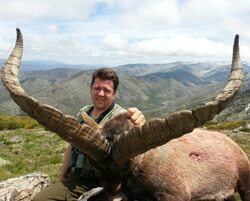 The Mountains in Spain are fantastic and especially the hunt for the gredos was spectacular. A very memorable event. Greetings from all family. Christian, William, Gustav, Anna & Erik. 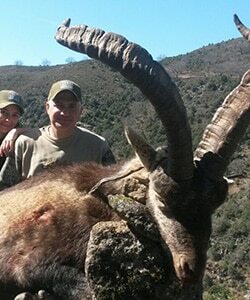 Thank your for another nice Gredos Ibex hunting experience. A big bronze medal Ibex. This time it only lasted half a day before shooting my Ibex. Hunting is hunting but this time it was fast. Thank you for a nice stay and hospitality. See you again. 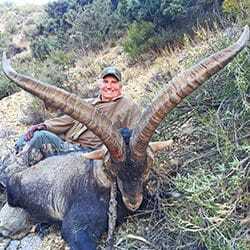 Antonio is a great person, an experienced hunter himself, and has access to some great hunting areas, he can customize the hunt if you want challenging hunt with fascinating scenery where the view changes in front of you as you work your way up. Thank you for a great experience where I was on a challenging hunt for Gredos Ibex in Sierra De Gredos, and get the opportunity to experience several groups Gredos Ibex, with from 20 to 50 animals in groups, and after a great climb we chose to eat a well-deserved lunch near the “Puerto Del Peon” and find that a large group of ibex that had the same thought, just 30-40 meters below us we saw a group Gredos Ibex lie down and take a rest, and they could not be immediately disturb. Thanks again for a great hunting experience. Thanks for some wunderful days in the Gredos Mountains. 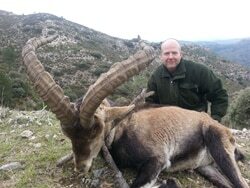 We had two amazing hunting days in the Mountains, which are a truely magnificent area, where I got a good Ibex. Everything was perfectly planned, the hunting, hotel, food and our last day in Avila. Looking forward to the Monteria in 2014. All the best, Mads Houe, Denmark. 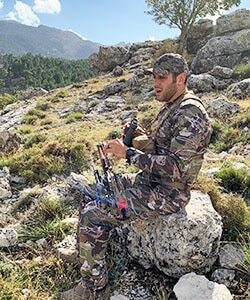 My name is Daniel, I’m a Spanish hunter who, with some friends, we have been hunting with IberHunting and Mistral for the Mid-Asian Ibex in Kazakhstan (Dshungarian Alatau area) from 30th July to 10th August 2013. The hunt was very well organised from pick up and assistance at the airport, transportation to the base camp, throughout all the hunt and back to the airport. The hunt began early in the morning from the base camp, where the accommodation, overall atmosphere and cuisine were excellent with plenty of explanations about the hunt. After a long journey on horseback and walking , we reached the top of the mountains, where we placed our fly camp and started spooting for the ibex. The game itself takes place at around 3000 meters, in pretty steep mountains with quite difficult approach in some cases, so the hunter must be in GOOD physical conditions to do this hunt. 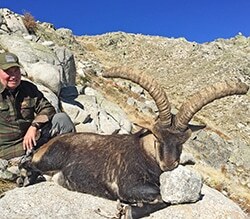 The hunting team is very professional and always willing to help you and the population of good trophy ibex is really high in that specific area. Under normal weather conditions 2-3 hunting days is well enough to harvest your trophy. 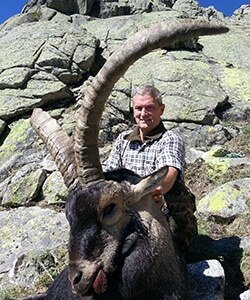 I took my “monster” Ibex at 330 meters in the evening of the first hunting day and it was surprisingly large and thick. After a long and hard horse/walk trip of about 100 km, during three real hunting days, we were back to the “high camp” and most of my colleagues were back on the same day or a day after. 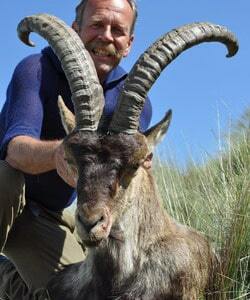 All of us we have harvest a really nice trophy, and one off us get two massive ibex in the same day. Special thanks to Tony Ulmer for leading me during the Hunt and to Antonio for their paperwork and the entusiam preparing all the game …. 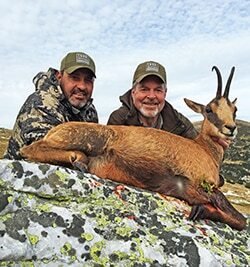 I would highly recommend that hunt with Antonio ( IberHunting ) and his team, the experience has been unforgettable, mountains are hard and highly demanding, but all in accordance with agreed. Thank you very much for the Hunt you have been prepared for my. Hi Antonio and thanks for some wonderful days again, everything was again perfectly planned. I got a perfect hunting experience in a wonderful country, and it will not be the last you see me. And next time it most be a Ronda we find to me. Hunting with you and your professional local guides was very enjoyable. The mountains were beautiful, there were plenty of animals, the accomodation and the food was great. I think all of us are very satisfied – three very good representative ibexes in 11 hours, it’s not only fortune. It was an excellent trip for us, it will be in our memories for the rest of our life. We are looking forward to visiting you again, and we can only give IberHunting our best recommendations. Special thanks for the journey of Alhambra! Thank you very much, for the last trip which was a really good experience and hunting in the right way. I would like to hunt with you again next year. 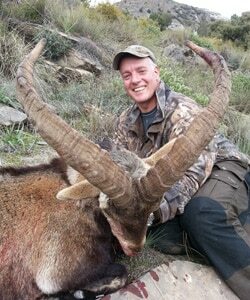 Thank you for some nice days in Spain when we hunted for Ronda Ibex. It was an excellent stay, super hotel, super catering and wine. I am very satisfied with me Ibex, it was a very good one and are looking forward to visiting you again. Many thanks for a great ride, I’ve enjoyed it so much, a SUPER nice trip, very nice and a great service and food/wine ect….! I have previously with great pleasure participated in hunts with Antonio, respectively Sierra María and “La Muela” area of Velez Blanco. And now once again enjoyed being on the hunt with Antonio and Paco, we have experienced some challenging hiking trips in the Sierra de Tejeda, first at Wild Boar and then hunt for Ibex, where it was a pleasure to experience the spectacular terrain with great variation switches between the one fabulous view after the other. I now look forward to again participate in a hunt with Iberhunting. Hunting with Antonio and IBERHUNTNG was truly one of the best experiences of my life! The accommodations were very clean and comfortable. Food was most fabulous and very plentiful. High numbers of trophy animals were seen. The guides and equipment used were some of the best. I greatly look forward to returning and hunt with IBERHUNTING, one day. 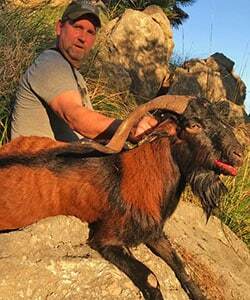 Our hunter Rusty Schultz with his Capra World Slam , Rusty gave us the opportunity to be part of his hunting adventure. Thanks, Rusty!!!. 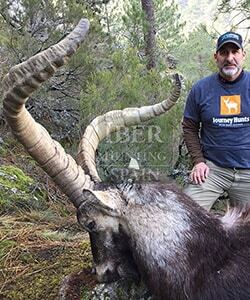 I went hunting with IberHunting Spain in the Mountains of Sierra Nevada for Ibex in the end of November 2012. There was a lot of Ibexes and the stalking was both physically challenging and very exiting. It is evident that the hunting pressure is not very high in the National Park and the hunt is very selective. I was in position to shoot several times before the stalker was happy with the size of horns of the animal in front of us. A part from the hunting I must also praise the food and the accomadation of the hunting trip. I can only give IberHunting Spain my best recommendations. 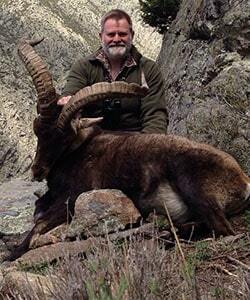 Thanks for the special journey and successful hunt of Ronda Ibex and Barbary Sheep. Your passion for the great hunt, and your friendship was unique. The accommodation, meals we ate, hotels we stayed, friendliness of everyone in the crew; they all were wonderful and I had a week to remember. I am planning to see you in a short time, thank you for everything. Many thaks to you my friend antonia it was very nice experiance. I cant wait to see you on 24th may in valensia for beseite ibex. Kindly and friendly accomodation. Nice dishes. Very good guides. More than 30 trophies in 3,5 days 2 hunters. Hunting with Antonio ( IBERHUNTING ) and his very competent local guides, was a real pleasure. They were extremly good at spotting the ibexes and very nice company too. Beautiful mountains and plenty of wild game made it a challenging and exciting experience. The accommodation and food was great, and I can hardly wait to go hunting there again. Hey Antonio, Tanks for a very good hunting. If you kom to Denmark you ar always welcome to may home. 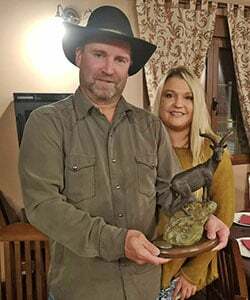 Iberhunting runs a very professional hunting organization and all the customers we have send down there, has had some great hunting experiences and fine trophies and are all very satisfied. 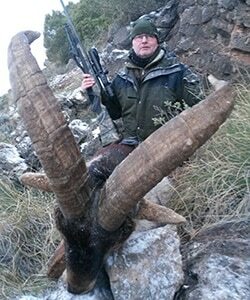 The trophies are of very high quality and it is possible to hunt all huntable species in Spain. I can highly recommend Iberhunting, both as partner and as a hunter, and I am always secured that my hunters gets the best possible treatment. 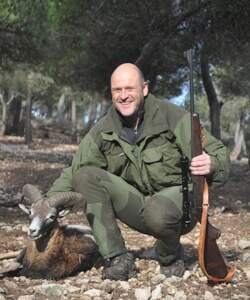 Harald & me enjoyed our hunting trip in Spain very much. It was really a new experience for us. I thank you for a very good hunting experience. It was exciting and different hunting because of the mountains and the challenges they give. It was a joy to see that your guide knew what he was doing; he really knew his mountain. Give him my best regards and say thank you for a good hunt. 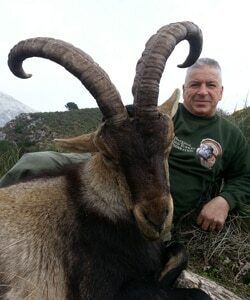 Thanks a lot for some memorable days hunting with you for Beceites Ibex and Barbary sheep. Everything was like I expected; a professional hunt of high quality for trophy animals of the different species. Especially I find it trustwothy that hunters, who for some reason do not manage to shoot the animals they have a license for, keep this personal license for three years. Which means that they can come back once again and finish the hunt! I was also very impressed, both by the way the population of this species are regulated and by the high density of animals. And not to mention the beatyful areas we hunted in, both in Sierra nevada and Andalucia. I recomand this hunt with out no reservation.